We're all familiar with terracotta–it's an easily accessible clay that comes in rich colors of red and orange–but what are some of the more distinct qualities that have led it to be so popular widely used over time? The word terracotta originates quite literally from the Italian translation "baked earth" and its use across the globe has a prominent place in history (and continues to be vastly used today). One of its earliest reference points was in prehistoric art, with some of the oldest pottery in time being found as far back as 24,000 BC. Interestingly, these early pieces were found to be Palaeolithic terracotta figurines, rather than cooking vessels, as you might expect, demonstrating how widely terracotta has been used in the art. Perhaps, terracotta’s most famous use in art was China’s Terracotta Army, which is a magnificent collection of terracotta figures of over 8,000 soldiers and 520 horses, found in the First Emperor of China, Emperor Qin Shi Huang’s mausoleum (246-208 BCE, but not discovered until 1974 by local Chinese farmers). Terracotta is widely preferred for sculpture, given its thick and malleable texture and eases to be molded. It’s a far easier material to work with than say marble or bronze. Terracotta also has a close link to architecture, most commonly in roof tiles and brickwork, as it’s incredibly durable, beautiful in color and one of the cheapest clays to work with. It's also a material with a lowered fire risk in buildings. Terracotta is also very commonly used to make flowerpots and highly decorative dinnerware plates. What Are the Properties of Terracotta? Terracotta is one of the most distinct types of clay you’ll find, given its rich, rust red/orange coloring. The reason for this distinct color is that the iron content in terracotta’s clay body reacts with oxygen and gives it a hue that ranges through reds, oranges, yellows, and even pinks. The properties of terracotta are that it’s a porous clay to work with, and it can also be used glazed and unglazed, which adds to its appeal. One coat of glaze is needed to make it waterproof. When terracotta is glazed, bright colors are often favored because they work brilliantly with terracotta’s low-firing temperature, approximately 1100 C (2012 F) to 1200 C (2192 F) to create a striking contrast with its orange body. These low firing temperatures also mean lower energy costs. 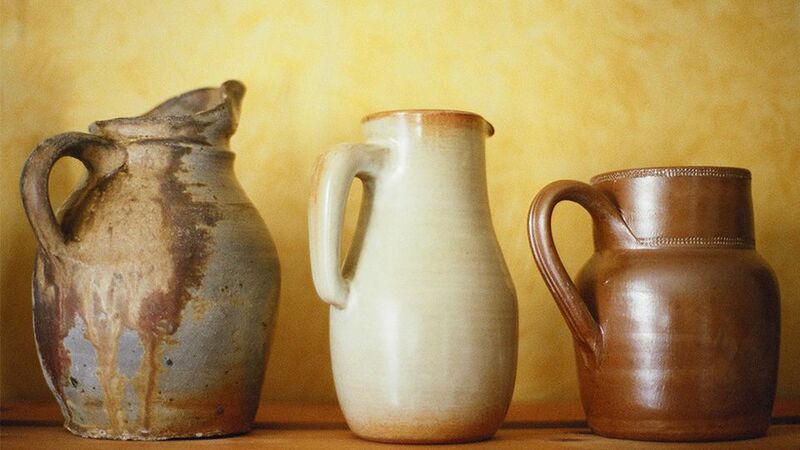 In some cases, terracotta has been fired as low as 600 degrees Celsius. Majolica ware can be created with terracotta by bisque-firing the terracotta pieces and painting them with an opaque white glaze and firing them again. Sometimes, nothing more than a clear glaze needs to be used on terracotta to enhance its natural fired color and give it a great shine. Primitive pieces of terracotta were just left to harden and bake in the hot sun, while later pieces (before kilns) were fired in the ashes of open fires. Another great property that terracotta has is that it can withstand varied temperature changes with a lower chance of cracking, making it incredibly functional. Where Can Terracotta Clay Be Found? One of the biggest reasons that terracotta is so prevalent in history across so many genres is that it can literally be found anywhere and is known as being the most commonly found clay across every continent. Terracotta is usually not a pure clay and is found mixed with other minerals full of flux and plenty of iron oxide. Where Can You See Famous Pieces of Terracotta? Visiting China to see the Terracotta Army for any potter is a once-in-a-lifetime experience. Located 23 miles from Xian City, it’s the largest imperial tomb in the country, covers a vast 558 acres and has been granted UNESCO World Heritage Site status. The Victoria and Albert Museum in London also has some brilliant examples, including a Pierre Merard bust and the Vienna Natural History Museum is home to the reported oldest surviving piece of work in the ceramic world dating back to 26,000 BCE; a figurine called The Venus of Dolni Vestonice, which was found in the Czech Republic. In terms of architecture, the Bel Edison Telephone Building in Birmingham is a fantastic grade example of Victorian terracotta.